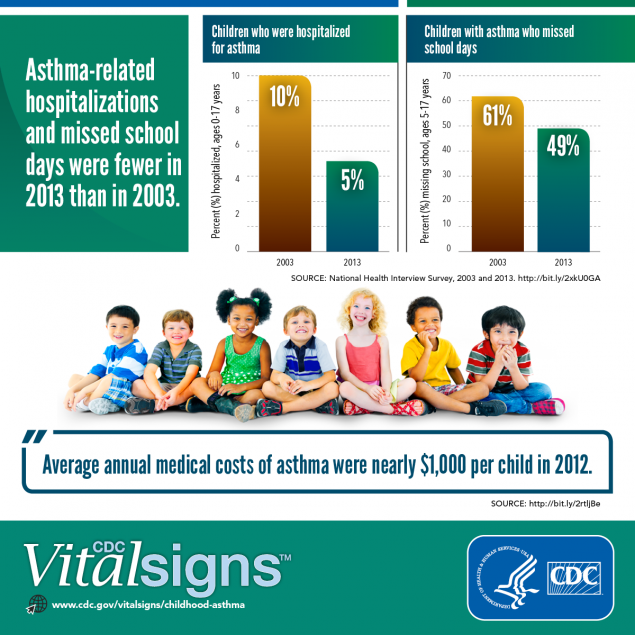 Asthma-related hospitalizations and missed school days were fewer in 2013 than in 2003. Children with asthma in the U.S. are having fewer asthma attacks, missed school days, and visits to the hospital, according to a new Vital Signs report from the U.S. Centers for Disease Control and Prevention. Today’s report shows that the percentage of children with asthma who experienced one or more asthma attacks in the preceding 12 months declined from 2001 (61.7%) to 2016 (53.7%). Even so, approximately half of children with asthma had one or more asthma attacks in 2016. Today’s report shows that some children are more likely to have asthma than others, including boys, children ages 5-17 years, non-Hispanic black children, children of Puerto Rican descent, and children from low-income families. In 2016, asthma attacks were most common among the youngest children, 4 years old and under. Work with children and parents to determine the severity of each child’s asthma, to develop an action plan for each child, and to share the plan with families, schools, and others. In addition, CDC promotes proven medical management of asthma, based on CDC’s 6/18 initiative. Such management includes proven actions such as trigger reduction, guidelines-based medical management, and self-management education. The initiative also promotes flu and pneumonia vaccination for all children, improvements in indoor air quality through smoke-free air laws and policies, and partnering with healthcare providers and others to lower asthma costs through improved control.